From August 26-27, the Wallace Foundation and Washington State Arts Commission host an Arts Participation Leadership Forum + Workshops called Engaging Audiences. The event is part of the Wallace Excellence Awards, which since 2006 has funded 54 arts organizations in Boston, Chicago, Minneapolis/St. Paul, Philadelphia, San Francisco and Seattle. 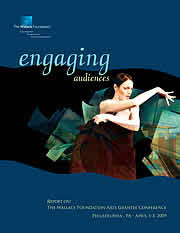 Over four years, these areas will offer insights for encouraging engagement in the arts. I am excited to be helping coordinate events in Seattle. The Wallace Foundation provides in-depth support to network people who value the arts with a place to share tactics for reaching existing and new audiences. The Arts Participation Forum + Workshops this Thursday and Friday are free. With researcher and consultant Alan Brown, participants will explore how audiences engage with various art forms, plus how arts organizations can connect with audiences. Additionally, the Wallace Foundation provides complimentary Arts Participation and Arts Education Research resources that encapsulate the stories and outcomes learned as part of their participation-building research.